Helping families build strength, stability and self-reliance through shelter. It is with a mix of sadness and gratitude that the Board of Directors announces Lee Smith Osina’s departure as Executive Director of Warren County Habitat for Humanity, effective December 18, 2017. Lee has been a champion of our organization and garnered community support for the need for affordable housing opportunities in Warren County since her start date in 2016. The Board, members and partners alike will miss Lee. We look forward to following the success of her career and are hopeful and excited for the next chapter of Warren County Habitat for Humanity as we continue to support our community to create affordable housing opportunities in Warren County. During this transition period, it is our priority to find the best individual to lead, while still maintaining a stable and effective organization. 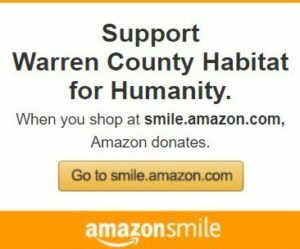 At Warren County Habitat for Humanity, we do more than build houses. We partner with homebuyers, volunteers, donors, businesses and community organizations to transform lives and rebuild communities. Houses are sold at an affordable, no-profit rate with no-interest mortgages to qualified home buyers who earn 30% to 60% of the area median income. They complete volunteer hours (sweat equity) and attend classes to learn the skills needed to successfully own and maintain a home for the rest of their lives. These individual homeowners become part of a larger group that works to bring change and new life to communities. Through community planning and neighborhood engagement, Warren County Habitat for Humanity encourages the growth of healthy communities throughout Warren County. If you would like more information about this press release, please contact John Hensley at 540-551-3232 or email at info@warrencountyhabitat.org.